Believe in the beauty of the Jersey Chair Oak & Cream Faux Leather, a wonderfully versatile design that will enhance a variety of different interior settings with its contemporary character. Modern meets classic with the amazingly stylish Jersey. 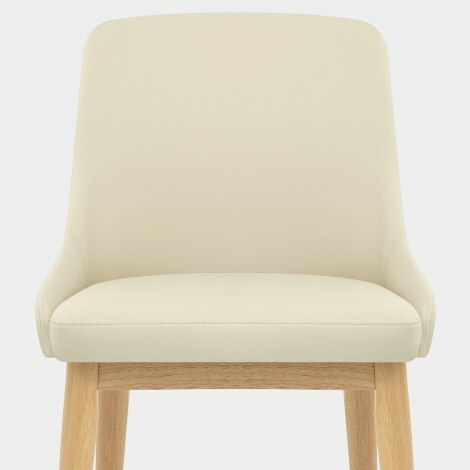 Padded for comfort, the supportive seat and backrest are upholstered in cool cream faux leather, sweeping gracefully round the seat for an encompassing feel. Crafted from a solid wooden frame with a natural oak finish, the four sturdy legs are capped by protective floor plugs to ensure the Jersey can be used on a wide range of floor surfaces. "These chairs are stylish, comfy, easy to clean"
I am so pleased with this set of four chairs. The colour is perfect for my room and table. They were easy to put the legs on - probably about twenty minutes per chair. Everything was perfect - thank you. Speedy delivery - match and fit snug around glass table, excellent value. Very pleased with product. Excellent service. Lovely comfortable and sturdy dining chairs. Arrived within 24hrs of ordering. Very well packed. Great goods and service. Lovelyl well made chairs. Well packed.Delivered within 24 hours of ordering on line. Very pleased.